The registration deadline for this weekend’s Oscar Wilde Liberation (OWL) Tournament has been extended to Thursday, May 17. A dozen players have registered thus far for the tournament, which will be run on KGS, and there are still slots available for interested players. This will be the second online tournament this year where players can earn points towards the North American Ing Masters tournament at this year’s US Go Congress in North Carolina in August, and the World Mind Sports Games in Lille, France, also in August. Click here to register. What do go players do after competing all day at the World Amateur Go Championship? Review their games, of course. 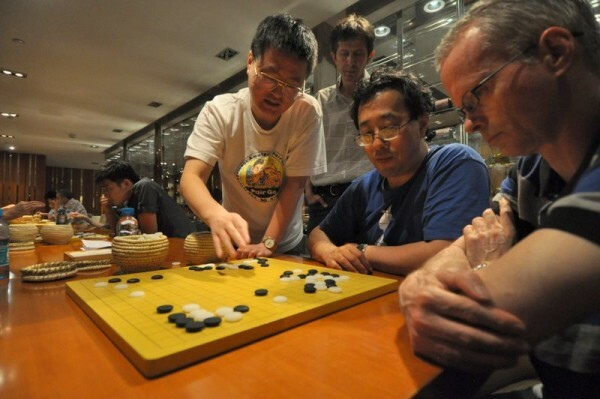 Here, U.S. player Yuan Zhou 7d — a longtime go teacher and author — analyzes a game Tuesday night in the Baiyun Hotel’s 30th-floor bar/playing room with Sweden’s Martin Li (center) and Pal Sannes of Norway, while Dragan Paunic of Bosnia-Herzegovina watches. 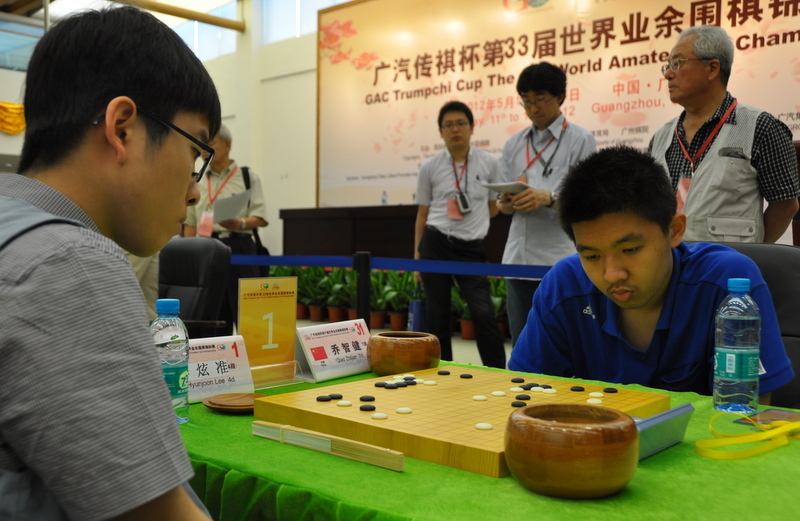 As always, China’s Qiao Zhijian was in his seat ten minutes early. This time, he used those ten minutes to take a short post-prandial nap, while in the facing chair Korea’s Lee Hyunjoon carefully positioned his belongings and then passed the time by looking around the playing area…click here for the complete Ranka Online Round 6 report. 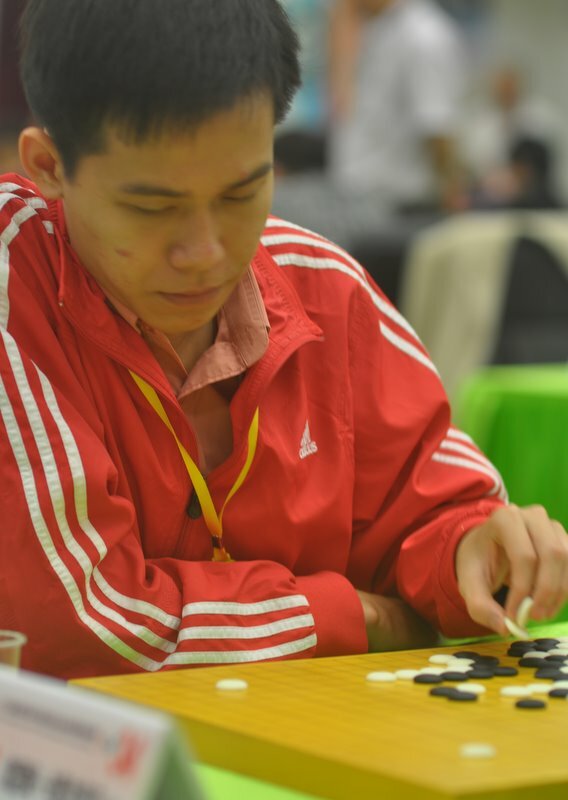 On Board 2, China’s Qiao Zhijian chose a variation of the Dosaku opening and played his first ten moves in less than one second each, quickly constructing a huge black framework in the bottom half of the board…Click here for Ranka Online’s complete Round 5 report. 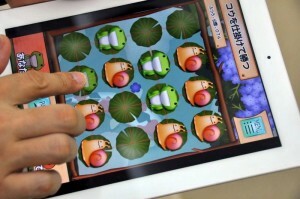 Nihon Ki-in Teams up with Cho U on New Go App: Colorful cats, dogs and frogs danced on Taro Matsuo’s iPad as the Go World editor enthusiastically showed off the Nihon Kiin’s playful go app developed with top pro Cho U 9P. The new app features cute cartoon animals that guide a beginner through learning the fundamentals of go in a “fun and accessible way,” Matsuo said. Now available in the iTunes app store in Japanese (search for Nihon Ki-in or go), the hope is to release an English-language version later this year. 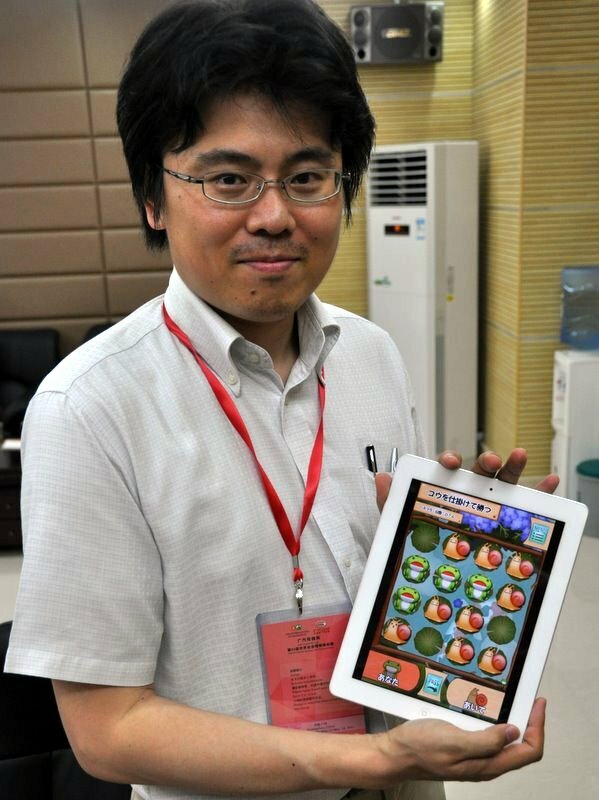 The app joins other Nihon Ki-in apps including its tsume-go (life and death) app; IgoFree, for playing go in-person on an iPad, and e-publications including Go World, Go Weekly (featuring playable game records), and more than ten go books, “with two more due out next month,” Matsuo says proudly. In the Gardens of the Guangzhou Chess Institute: Clouds of dragonflies flitted above us as we took in the view from the garden atop the Guangzhou Chess Institute. A waterfall burbled merrily nearby, giving a measure of relief from the oppressive heat. Built for the 2010 edition of the Asian Games, the Institute is a spectacular venue for go, chess and Chinese Chess events near scenic Baiyun Mountain, and includes two major playing halls, rooms for players and officials to stay in, and study rooms, as well as lush gardens and an impressive museum dedicated to the three games. 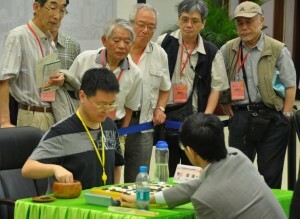 The museum celebrates the Chinese origins of go, and the key figures in that history, from Ming emperor Yao, who legend says had it invented for his son, to Wu Qingyuan, known to the west as Go Seigen, the prodigy who triumphed so spectacularly in Japan, became one of the best players of all time and, with Kitani Minoru, broke away from the traditional opening patterns to develop modern go. Other Chinese go giants like Chen Zude, Nie Weiping and Gu Li are also highlighted, although all the museum text is in Chinese, leaving the western vistor to puzzle out things like the player’s names on the historical games on the walls (shown here by So Yokoku 8P). 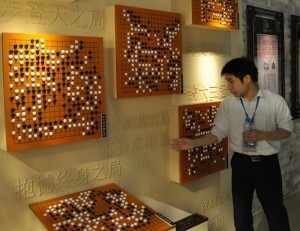 An exhibition of English-language panels covering much the same material were produced for the WAGC main playing area and perhaps will be displayed in the museum. 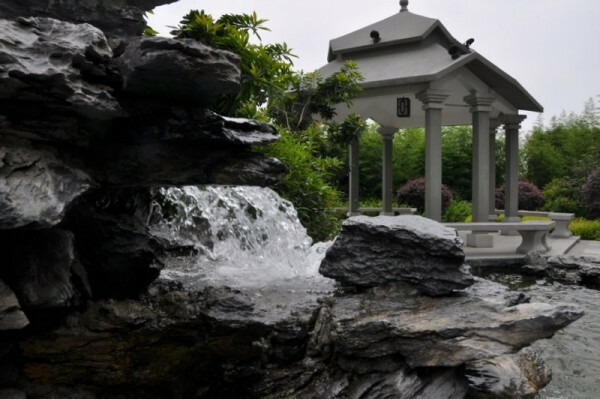 The exhibits of boards, pieces and carved wood panels in the cool and shadowy museum are inviting in Guangzhou’s heat, but so too are the whisper of the breeze in the bamboo and rustle of the twisted pines in the Institute’s gardens, as the player’s stones click steadily along like cicadas in the trees. 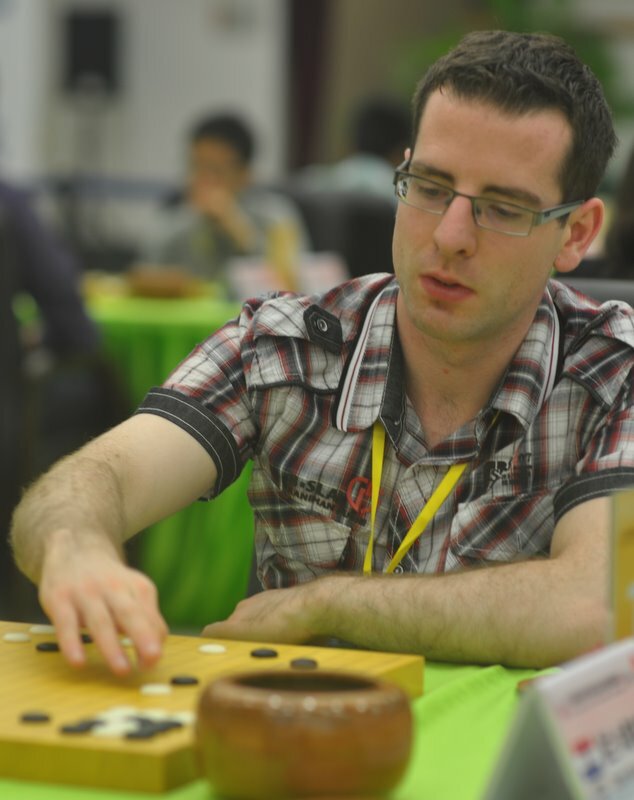 A Glimpse of James Davies: James Davies does not flaunt his encyclopedic knowledge of the game of go, its history and players. It’s not his style. 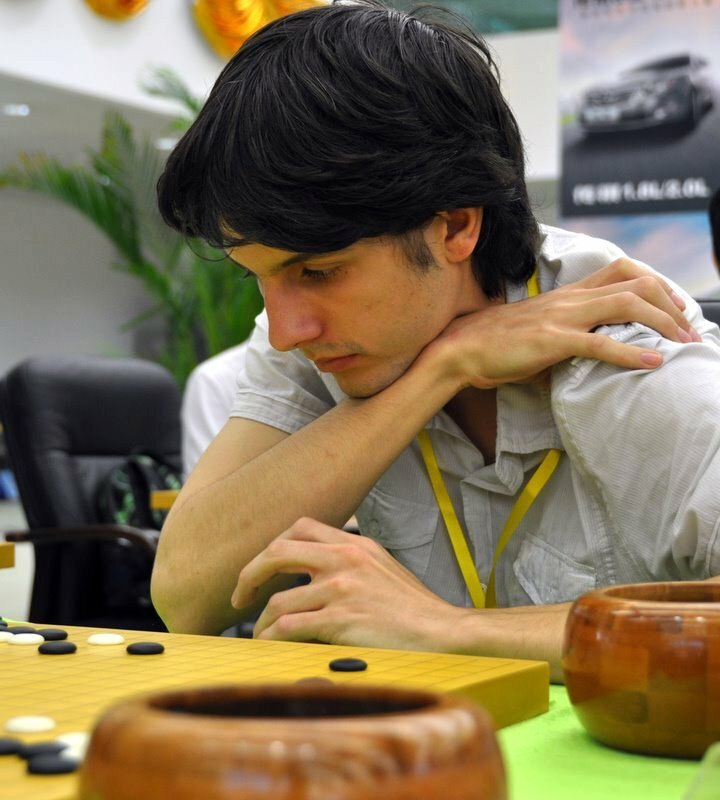 The author of elegant Ishi classics like An Introduction to GO, 38 Basic Joseki and Attack and Defense, who’s covering the WAGC for Ranka Online, Davies drifts about the playing area, seemingly aimlessly, keenly watching and listening, jotting down the occasional note, asking a quiet question or two of players exiting the playing area. Over six feet tall with a perfectly-trimmed bushy mustache that hides his expression but not the hint of a twinkle in his eyes, and always impeccably attired in a sports coat regardless of the oppressive heat, Davies’ comprehensive round-by-round reports and provide a keen eye for the telling detail, the way one player places his stones, the demeanor of another, the positional status of each game Davies turns his attention to. In another life, perhaps, the Baltimore native might have been a sportcaster, the kind with the true fan’s appreciation of the game and a gift for the sharp-eyed observation, dryly delivered. Tuesday, May 15: On Board 2, China’s Qiao Zhijian chose a variation of the Dosaku opening and played his first ten moves in less than one second each, quickly constructing a huge black framework in the bottom half of the board…There were fewer fireworks on Board 1, but after a good opening and a bad middle game, Korea’s Hyunjoon Lee outplayed DPRK’s Ri Kwang Hyok in the endgame and then won the final one-point ko to prevail by 2.5 points…On Board 7, Samuel Aitken (UK, at right ) used his fifth move to make a three-space extension from the third line to the second line, a new pattern that has been appearing in professional games. He and Yuan Zhou (US) battled it out for the next two and a half hours, but in the end Aitken resigned…On Board 9, Lukas Podpera (Chechia) and Japan’s Nakazono Seizo also battled it out for two and a half hours, but today Nakazono’s Japanese supporters had the satisfaction of seeing Japan’s amateur Honinbo score a convincing win in the longest game of the round. The fastest was the game between Mongolia and Portugal, over in less than an hour and described as ‘an easy win’ by Portugal’s Daniel Tome. The most dramatic involved the players from Romania and Singapore: “I had the game in my pocket for at least 90% of the time,’ said Romania’s Cornel Burzo after it ended, ‘but with the clock counting the time, I got stressed and tried to shorten the process by killing a group. The moment after I played the stone I realized it was a catastrophic mistake. I went from something like a hundred points ahead to a hundred points behind.” Click here for the complete report on Round 5. 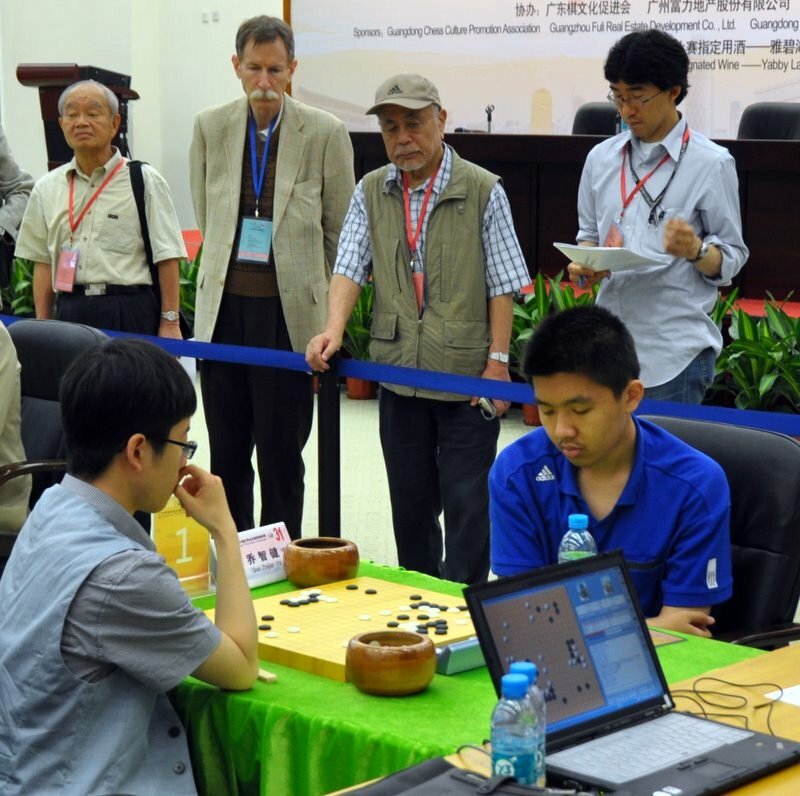 Click here for Round 5 game records, including Taipei-China (commentary by YangShuang 3P); Czechia-Japan; DPRK-Korea; UK-US. 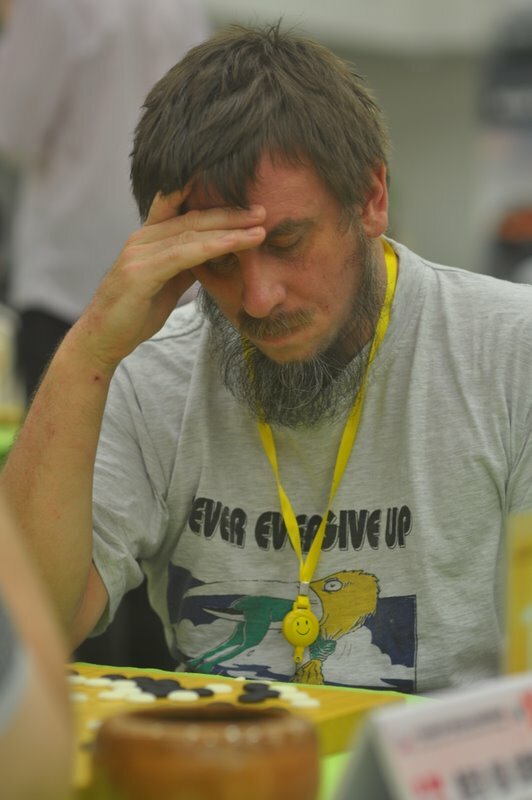 With all players present except the still missing Moroccan, the afternoon round started a few minutes early…Click here for Ranka Online’s report.